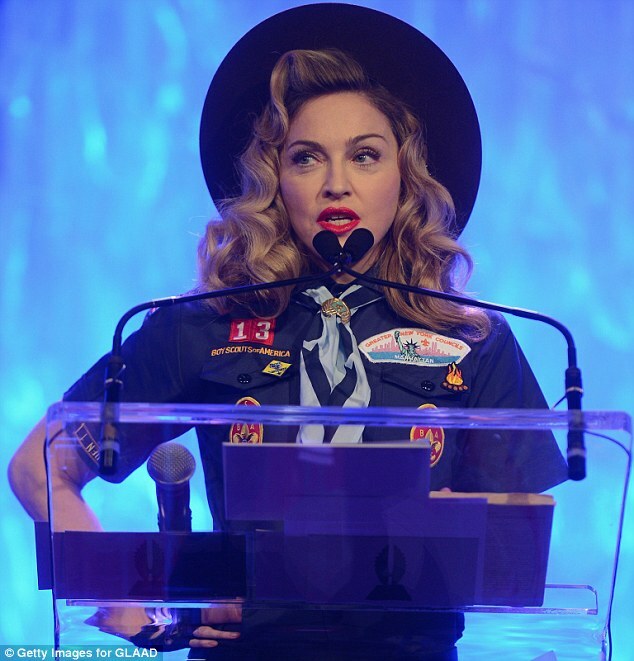 Her outfit choices are known to shock but Madonna decided to dress up as a type of Boy Scout never seen before – and it certainly attracted some attention. 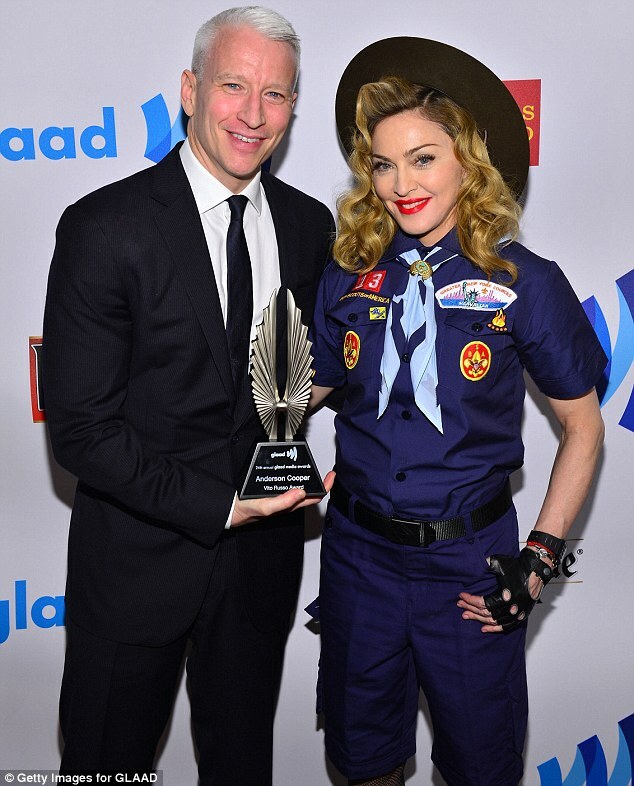 Anderson Cooper and Madonna ended up in a steamy clinch on Saturday night as they attended the GLAAD Media Awards. The mismatched pair smooched after she presented the news anchor and daytime TV host with the prestigious Vito Russo Award on stage at the Marriott Marquis in New York City. The grey-haired TV presenter pulled her in with both arms and planted his pout on hers as part of their section in the show. As if the lip-to-lip action wasn’t enough to make the pop star’s 16-year-old daughter Lourdes feel slightly embarrassed, perhaps her festive ensemble would. Madonna arrived dressed in a Boy Scout Of America costume, her wavy blonde locks underneath a brimmed hat. Madonna famously locked lips with pop rivals Britney Spears and Christina Aguilera on stage at the 2003 MTV Video Music Awards. She explained why she chose the clothing – which included a blue belted play suit with fingerless gloves, fishnet tights and biker boots – as she stood at the podium for the gathering to honour celebrity advocates of the Lesbian Gay Bisexual Transgender community. She told the audience during a long speech: ‘I wanted to be a Boy Scout, but they wouldn’t let me join. ‘I think that’s f**ked up. I can build a fire. I know how to pitch a tent. I have a very good sense of direction. I can rescue kittens from trees. Listen, I wanna do for the community.’ She then added that perhaps most valuable to the organisation with 2.7 million youth members and over 1million adult volunteers, she is very good at gathering up men.